Astronauts Robert Behnken and Nicholas Patrick began repressurizing the International Space Station's Quest airlock module at 3:49 a.m. EST, ending a successful six-hour 32-minute spacewalk after making initial connections between the lab and the new Tranquility module. The 15-ton Tranquility module was eased into position by Kay Hire and Terry Virts, operating the space station's robot arm, and robotically bolted in place on the left side of the International Space Station's central Unity module to accomplish the primary goal of the shuttle Endeavour's mission. The big module, the last major U.S. addition to the space station, was bolted in place at 1:20 a.m. EST. Behnken and Patrick then hooked up avionics cables and keep-alive power to provide temperature control until coolant lines are attached and internal power circuits are activated later in the mission. "Houston, for EVA, you guys can be advised we have good avionics and heater cable activation, so all those connections look good down here," radioed Hal Getzelman from mission control. "Great news,�Houston, we appreciate it," astronaut Stephen Robinson, the spacewalk coordinator, replied from Endeavour. 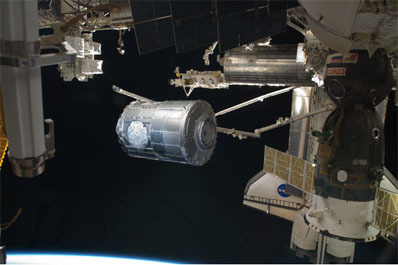 "And we also got a good gross leak check on the vestibule" between the Unity and Tranquility modules, Getzelman added. "Oh, that's outstanding news, thanks for letting us know, Houston," Robinson said. "Good work, gents." "Well thank you, Steve," replied Behnken, who also took a moment to thank the crew's trainers. "I'm really glad for how successful it was, for getting this far and getting that power on node 3. Let the activation of node 3 begin! "I whole heartedly agree," Patrick said. "It's been a great year of training with all those wonderful trainers back in Houston and I also really appreciated the support from our friends at the NBL (Neutral Buoyancy Laboratory training pool) who made all the training possible." "A noble start for the STS-130 EVA extravaganza!" Robinson concluded. This was the first of three spacewalks planned by Behnken and Patrick. Total space station EVA time now stands at 861 hours and 34 minutes. Behnken's total through four spacewalks is 25 hours and 51 minutes. Behnken and Patrick switched their spacesuits to battery power at 9:17 p.m. EST, officially beginning the planned six-and-a-half-hour spacewalk. "Have a great EVA and we'll see you in a few hours," Endeavour commander George Zamka radioed from inside the space station. "Thanks for all your help," George," Behnken replied. "Gentlemen, it's a great day outdoors, nighttime right over Rio de Janeiro," Robinson called. "In addition to greeting you guys outdoors, I'll greet the big EVA team down in Houston. It's a great day to do EVA. It's a good time to finally get started."